Have I really not blogged this great shirt? 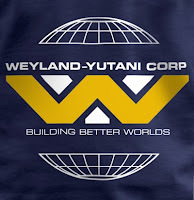 Show your Alien series love with the one corporate logo tee you never have to feel bad for wearing: a logo for a corporation that doesn't really exist. From Last Exit To Nowhere. A cheaper, if also less awesome, tee for USericans is available from T Shirt Bordello.